Being counted amongst the finest manufacturer and supplier of Rock wool Panels, we engage in using of the finest raw materials that are available.Our offered panels comes in precision design and fabricated finish and provide for easy installation as well as lasting durability. Its highly economical nature and easy maintenance, makes the product one of the primary preference in the market. Offered panels used as the wall or roof for cold storage & industrial workshop. We offer our client the cost effective prices to meet the requirements accordingly. 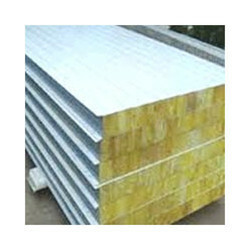 Blessed by a team of competent professionals, we are highly engrossed in providing the best quality Rockwool Sandwich Panels. These panels are manufactured under the stern direction of our dexterous professionals using quality tested raw materials with the aid of ultra-modern techniques. 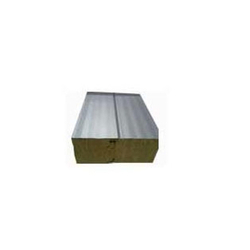 The offered panels are used as roof or wall in industrial workshop or cold storage. Besides this, our patrons can avail these panels from us at competitive prices. Our long years of expertise have made us to provide a wide range of Rockwool Panels. Basically used for installation in cold storage, the panels offered by us are much applauded by the clients. Our offered panels are manufactured under the stern guidance of our diligent professionals using premium quality raw materials and innovative techniques. Also, our clients can avail the provided panels at market-leading prices from us. We are the prominent organization engaged in offering an excellent quality gamut of Rockwool Insulated Panels.The panels provided by us are manufactured using optimum quality raw materials and innovative techniques under the stern guidance of our dexterous professionals. 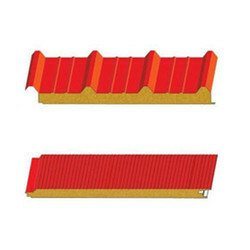 These panels have high insulation capability hence find application as roofing structure of cold storages. Furthermore, our clients can purchase these panels at industry-leading prices from us.